THIS WILL HELP HER FIGURE OUT THE LOGIC OF IT ALL.. THERE ARE ALWAYS HUNDREDS OF THOSE LOGICAL HICCUPS TO FIGURE OUT WHEN YOU ARE WRITING THIS STUFF. Today was a day of doing basically nothing. We got up normal time and Ed had to go help a friend repair a stone wall. The girls and I stayed in this morning and relaxed. Then we had our meeting at the Kingdom Hall from 1-2:45. When we got home we all put our pajamas on and watched movies or football. he decided it was a perfect time for George zoomies. So he ran around and around in circles. At one point he went around a corner and slide on his belly and face. Then jumped up and zoomed some more! To bad that wasn't on video. So nothing really to report for exciting adventures today! It was a nice way to get ready for the start of another week. Thanks for checking in. PROBLEM WAS -- I WAS UP VERY EARLY- AND GOT INTO BLOODLINES--- AND THE FACT THAT TOO MUCH IS GETTING RELATED TO BENTLEY-- WHO IS THROWING WONDERFUL PUPS FROM A BUNCH OF WIVES... BUT....... AND HERE WE GO....I HAVE TO THINK BEYOND THIS BUNCH OF 31 (BACK TO 32 BECAUSE MEAUVE IS BACK FOR THE HOLIDAYS)THESE ARE DOING BEAUTIFUULLY... ON SCHEDULE FOR THE SPOON FEEDING ROUTINE.... AND I REFUSE TO BE FRIGHTENED BY THE NEIGH SAYERS "WHAT ARE YOU GOING TO DO WHEN....XXXXXXX.....?" " any horizontal space will accumuate disassociated objects"
problem being, all the objects have - at one point in their lives beeen fascinationg. "BAILEY- THE MONEY HUNGRY MUTT" IT CAN BE GOOGLED-- MINE DOES WORK AND IS A FASCINATING DESIGN. SPEAKING OF KEEPING THINGS NO LONGER INTERESTING TO ANYONE ELSE...like photos of your kids when they were 2 years old. When my parents died, i suddenly realized there was no one left to WHOM I COULD SHOW FAMILY PICTURES.... NOW THAT THE .MAJOR FUNCTION OF THAT "CELL PHONE" CONTRAPTION IS NO LONGER A TELEPHONE, BUT A PORTABLE SCRAPBOOK,... THESE PORTABLE SCRAPBOOKS MAKE THE GRANDPARENT FUNCTION IS EVEN MORE CRITICAL. NOT UNLIKE THIS DAILY DOGGIE ON A DAY WHEN IT AT LEAST VERIFIES THAT I AM ALIVE- BUT SHOULD BE DELETED AS JUNQUE. MOST OF THE BRILLIANT IDEAS COME FROM MY SUBCONSIOUS MIND COLLECTING DISASSOCIATED FACTS FROM CNN AND IT'S ADVERTISERS . LAST NIGHT I WAS WONDERING IF THEY SHOT THE GUY IN COLORADO THEY COULD KEEP HIM ALIVE LONG ENOUGH TO "HARVEST" ANY OF HIS PARTS... I WOULD HAVE NO PROBLEM WITH THAT..AS LONG AS HIS IDEAOLOGY DIDN'T GET HARVSTED WITH HIS KIDNEYS. I HAD SOMEONE WHO SENT ME AN EMAIL ---SERIOUSY COMPLAINING ABOUT THE TEENAGERS WHO BENT OVER AND HAD A PLUMBERS CRACK SHOWING AND HAD TO SHUT OFF THE NURSERY CAMERA... TO WHICH GRACE JUST REPLIED "TELL THEM TO SENT UNION SUITS OR COVERALLS FOR EVERYONE--"
( GRACE IS TALL AND WEARS MENS- TALL 2XL). TAKES ALL KINDS... AND THEM'S ALL HERE. WE HAD A SPECTACULAR DINNER THANKS TO RICHARD-- AND TO GRACE WHO'S DECORATIONS WERE- PER USUAL OVERWHELMING... COMPLETE WITH ARIOT SNORING AWAY ON THE ONE BED.... IT WASN'T TIL AFTER DINNER THAT I DISCOVERED THAT THE CANDLES WERE NOT REALLY CANDLES BUT BATTERY RUN-- EXCELLENT FAKES---LOOKED REAL ! BECAUSE THE THANKSGIVING HUNT IS SORT OF A "SPECIAL DEAL" TO ALL THE MYOPIA HUNT MEMBERS.... EVERYBODY WANTS TO RIDE IN IT... SO EVEN THO THERE IS AN "INVATATION ONLY" POLICY, THERE IS A GREAT NUMBER OF BORROWED HORSES AND RIDERS OF UNKNOWN CAPABILITIES-- PARTICULARLY MEN WHO RODE ALOT IN THEIR YOUTH, AND NOW HAVE TROUBLE BUTTONING THE PRESTEGIOUS RED JACKET AROUND THEIR GIRTH WHO BORROW A FRIENDS HORSE. THIS COMBINATION LEADS TO MANY PAUSES WHERE RIDERS STAND AROUND- AND OFF IN THE DISTANCE THE ONLOOKERS ARE TREATED TO THE SOUND OF AN APPROACHING AMBULANCE... WHILE SOME PEOPLE TRY AND CATCH A LOOSE HORSE. JANIINE MADE IT AROUND, BUT A FRIEND OF HERS DID NOT-- WHEN HER HORSE FELL OVER A FENCE AND ROLLED OVER HER.. THE REST OF THE BUNCH KIND OF DISMISSED IT BY HAPPILY SAYING "SHE COULD MOVE ALL 4 EXTREMITIES AND THE HORSES TROTTED OUT FINE"-- I DID HEAR LATER SHE WAS HOSPITALIZED WHILE THEY QUESTION THINGS LIKE "SPLEEN".. -----A VERY DIZZY BUNCH OF PEOPLE. You will be receiving 4 “In Training” patches and one “In Training” vest for the pups from Sir Thomas by Nov 30. Also, I met with the owner/director of Summit Dogs. I really liked her, and though she currently works with (you guessed it) labs and goldens, she asked me about Great Danes. She seemed to ask the right questions and was so down-to-earth (as in, not full of herself at all). She seems like she knows dogs but at the same time is eager/open to information. For example, she currently sends puppies out to trained volunteers for socialization and basic puppy stuff but seems that she’d rather – or at least would consider – raising on site. They recently purchased 17 acres and have plans for buildings (kennels, training facility, guest lodging for recipients-to-be). They have about a dozen pups in socialization right now. And they currently train for mobility but not ambulatory mobility (which she’s interested in and which I could see her watching me with Tommy). The dogs she has now get trained for mostly wheelchair recipients to aid in retrieving, turning on lights, opening doors, transferring in and out of chair. Hope all is well there! Miss everyone! I WOULD LOVE TO FIND MORE PEOPLE AROUNG THE "LOWER 48" WHO C OULD TRAIN DANES...IT IS ABSURD TO RESTRICT IT TO GOLDENS AND LABS-- MOSTLY ON THE ABILITY TO RETREIVE.. SOOOOOO MANY PEOPLE DO NOT NEED THE LIGHTS TURNED ON AND STUFF PICKED UP.. THAT LIGHT SWITCH ON-TURNING SOUNDS A PUBLIC RELATIONS GIMMIC TO ME......IN A REAL LIFE SITUATION HOW MANY PEOPLE ACTUALLY NEED THAT.. ESPECIALLY WHEN IT TAKES A WHILE TO TRAIN FOR THAT... - WOULD THAT TIME BE BETTER SPENT TRAINING ANOTHER DOG TO BE MINUS THOSE JOBS. IN THE MIDDLE OF LAST NIGHT I THOUGHT I DID HEAR SUCH A STORY ON CNN. BUT UNFORTUNATELY ... I HAD NO PEN/PAPER NEXT TO THE BED.. AND NOW I HAVE FORGOTTEN IT... BUT WAS REMINDED OF THAT "OVERNIGHT" SHOW. SHE WAS A CONTROVERSAL PERSONALITY WHO LOGICALLY GOT INTO MANY INTERESTING SCRAPES WITH TV BRASS..
A GOOD - OLD - BOOK. I GOT UP FOR MY USUAL MIDNIGHT PROWL AND ANITICPATED THE NORMAL --TURNING ON THE FAUCET MAKES WATER COME OUT.... WRONG ! ALL THAT NOW MEANT I STILL HAD NO WATER AND HAD TO FIGURE SOMETHING OUT TIL SOMEONE ELSE FIXED WHATEVER WAS WRONG. WE HAD A HOUSE FIRE --JAN 1 19XX? 100% BURN TO THE GROUND-- AND MY BIGGEST PROBLEM WAS WATER- BECAUSE I HAD ? 10 HORSES IN THE BARN... AND THE WATER CAME THRU THE HOUSE TO THE BARN--- EXCEPT THE HOUSE WAS GONE AND THE WATER FROZE..
THAT KNOWEDGE --- CURRENTLY--- IS WHY I NEED TO REMEMBER TO PUT A PILE OF HORSE MANURE OUTSIDE THE BACK DOOR OF THE LAUNDRY BUILDING-- IT IS EITHER THAT OR PAY 4 MILLION $$ TO RE- DESIGN THE SEPTIC SYSTEM BECAUSE THE SEPTIC PIPE COMES OUT RIGHT UNDER THAT DOOR AND IS NOT DEEP ENOUGH TO STAY OUT OF TROUBLE... UNLESS COVERED WITH A WARM BLANKET THE NATURAL WAY... HORSE SH#T. WE DO HAVE A BACK UP WATER SUPPLY- A DEEP 500' WELL- WITH DRINKABLE WATER THAT SMELLS LIKE DEAD FISH--- I CAN WATER THE FLAT FIELD WITH IT EVERY AUGUST..AS LONG AS WE HAVE ELECTRICITY.... THE MAN WHO TESTED IT DECLARED IT DRINKABLE-- BUT SUGGESTED WE CONSIDER MINING IT- IT HAS SO MANY MINERALS IN IT. BEFORE I MOVED TO IPSWICH-- I REMEMBER PEPSI BOUGHT SOME LAND IN LYNNFIELD THAT HAD A NATURAL SPRING ON IT AND IN TRYING TO FIGURE OUT WHY THAT HAD HAPPENED I MADE THE STATEMENT "IT WOULD NEVER MAKE SENSE TO USE GASOLINE TO TRUCK AROUND WATER" -- HOW WRONG WAS I !!! I MENTALLY MAKE NOTE OF WATER--- WHICH IS WHY I BOUGHT THIS PROPERTY WITH HOOD POND ACROSS THE STREET....AND WATER--- IS THE REASON I HAVE A RIGHT OF WAY BEHIND THE ARENA TO THE LAKE-- IT WAS WRITTEN IN THE OLD DEED- THAT I COULD USE IT TO DRIVE MY "STOCK" TO HOOD POND TO WATER THEM. WATER IS ONE REASON I AM NOT THRILLED TO BE IN CALIFORNIA-- ONE GOOD EARTHQUAKE AND THERE WILL BE ALOT OF THIRSTY PEOPLE RUNNING AROUND WITH EMPTY PLASTIC BOTTLES. CAMERA MARK--- CASUALLY REFERRED TO A "CLOSET" IN HIS DARTBOARD BUILDING AS A SPRING THAT FED THE SODA COMPANY WHICH USED TO OWN IT.-- ALTHO HIS DARTWORLD DOES A HUGE BUSINESS, COULD BE THAT SPRING WOULD BE A BIG MONEY MAKER TOO. I HAVE HEARD BELLA AND GEORGE WILL BE THERE---I'M ALWAYS AWARE OF A PACK OF DOGS, THAT PACK OF 40 HOUNDS IS USUALLY INDER CONTROL... BUT I SUGGESTED THEY NOT GO TOO NEAR THE PACK.... MAYBE EVEN RIDE ON THE GOLF CART. I HAVE PARKED THE RED GOLF CART AT ANNS BECAUSE THE HUNT GATHERS ACROSS THE STREET IN A BIG FIELD WHERE WALKING COULD BE A PROBLEM. ANN JUST EMAILED ME "THAT IS NO GOLF CART, IT IS A BUS"
P.S. THE WATER IS BACK ON..
BACKYARD SWINGS....WHO IS THE SADISTIC SOUL WHO MAKES THAT PRINT THAT SMALL?? I HEARD ON THE TV ADS IT WAS GOOD FOR ARTHRITIS----WHY WAS THERE NOT SOMEONE IN THE ALEVE CORPORATION TO STUDY HOW MANY PEOPLE WITH ARTHRITIS WERE AGING WITH FAILING EYESIGHT- AND NEED TO BE ABLE TO READ WHAT TO DO WITH THE STUFF..
MAYBE .. LIKE READERS DIGEST-- THEY HAVE A LARGE PRINT EDITION I DON'T KNOW ABOUT..
WHOEVER THAT PERSON WAS WHO DESIGNED THAT LABEL, HAS A TWIN WHO WORKS FOR THE WHIPPED CREAM MAKERS GUILD.. AFTER DAYS OF STRUGGLING WITH THE DIRECTIONS ABOUT PRESSURIZING NO2 CANNISTERS WHICH HAD A NASTY TWIST OF HAVEING TINY PRINT ON WHITE PAPER IN VERY LIGHT PINK INK, RICHARD FINALLY GOT ONE CANNISTER TO WORK. ABOUT ALL WE HAD TO GO ON WAS A TINY PICTURE OF ONE NO2 THING WITH .5L NEXT TO IT.... AND TWO NO2 CANNISTERS WITH A 1 L NEXT TO IT.. THIS IS TRICKY..... BECAUSE THE DISPENSERS SEEM TO COME IN .5 LITER AND 1 LITER, WE ASSUMED YOU NEEDED 2 OF THE BULLET NO2 "THINGS" WHICH MEANS THAT YOU HAD TO BE ABLE TO REMOVE THE FIRST WITHOUT HAVING CREAM SHOOT OUT THE LITTLE HOLE ALL OVER THE CIELING.. IT WAS A VERY SOPHISTICATED AND DANGEROUS ASSUMPTION. IT DOES SEEM TRUE THAT YOU CAN REMOVE THE POWER NO2 THING AND IT MUST HAVE A VALVE IN THAT PREVENTS THE CREAMY CEILING SYNDROME. NOW THERE IS A CARROT IN FRONT OF THE DONKEY... BOY DOES THAT SOUND GOOD.. THE VERY FEW INSTRUCTIONS WE FOUND RELATED TO -- NO GRANUALS( LIKE SUGAR--MAKE SYRUP OR USE POWDERED?) AND A SPECIFIC NUMBER OF SHAKES WHICH HAS TO DO WITH THE BUTTERFAT CONTENT OF THE CREAM. BUT IS IT EVER GOOOOOOOD ! THE AGING AND MEEK PART I STARTED WITH- I NEVER MEANT TO GET INTO THE TOPIC OF CREAM... MY OBSERVATION ON THAT IS ... NOT ONLY IS MY HEARING LESS THAN DESIREABLE- BUT I HAD TROUBLE SEEING MARK'S TOY ...DRONE... IF HE WENT MUCH HIGHER THAN THE TREES ( WHICH HE DETERMINED TO BE 120 FEET TALL....) GRANTED THERE WERE WHITE FLUFFY CLOUDS AND IT IS WHITE--- BUT 4 PEOPLE STUCK THEIR FINGERS UP IN THE SKY AND SAID "YOU CAN'T SEE THAT???" WHICH IF I COULD SEE IT , THERE WOULD HAVE BEEN NO DISCUSSION ABOUT MY NOT SEEING IT. WE BROUGHT HER IN THE HOUSE....AND AFTER LETTING HER RELAX AND INVESTIGATE ALL THE NOOKS AND CRANNEYS... I PICKED UP THE TREAT BOX, WIHT JUST A VERY MINOR NOISE-- AND HER HEAD TURNED-- BOTH WAYS FOR A START-- BUT SHE CLEARLY HEARD THE NOISE AND RECOGNIZED IT AS COOKIES. SHE DID NOT REACT AT FIRST TO THE PUP PUP PUP USUAL , BUT AFTER LEARNING THAT THE PUP NOISE ALSO MEANT COOKIES, SHE BEGAN TO RESPOND DIRECTLY TO THAT... CLAP YOUR HANDS GETS NO REACTION-- BECAUSE SHE DOES NOT KNOW WHAT THAT NOISE MEANS... SHAKE TEH BOX OF COOKIIES WILL BRING HER ACROSS THE ROOM. I WILL ALLOW THAT HER HEARING MIGHT... I SAY MIGHT... NOT BE WHAT YOU COULD CALL ACUTE.. IT WILL NEED FURTHER INVESTIGATION... BUT THE WHITE DEAF LABEL IS NOT DOING HER ANY FAVORS... SO SOCIALLY SHE MIGHT BE A LITTLE BEHIND THE OTHERS-- COULD BE OUR FAULT ... LETS ASSUE SHE IS NOT DEAF FOR THE MOMENT. WE WILL HAVE A BUNCH OF FOOD IN THE TRAINING ROOM AND ANY VOLUNTEERS, CAMERA PEOPLE OR ASSOCIAES WHO ARE AROUND ARE WELCOME TO COME EAT. SINCE HE GOT THE WHIPPED CREAM MAKER GOING... WE HAVE TO GO TO COSTCO AND STOCK UP ON HEAVY CREAM FOR TOYING WITH...(MEGAN HAS VOICED A PREFERENE FOR GREEN COLORING) UNTIL WE RUN OUT OF THE NO2 THINGS. it did mean i had to write on the floor that the little brown spot was a hole in the floor- and not puppy poo..
the calendars are in-- my first comment--THEY WEIGH A TON !! the van full needed unloading into the garage- and thothey only weghted 35 pounds ( he said) whatever the van floor was, they did not slide - which became my job-get a foot behind a carton and push to the door. they are a thing of beauty... and i guess we are ready...i don't know abotu this pitney bowles scale thing etc-- hopefully theresa does. 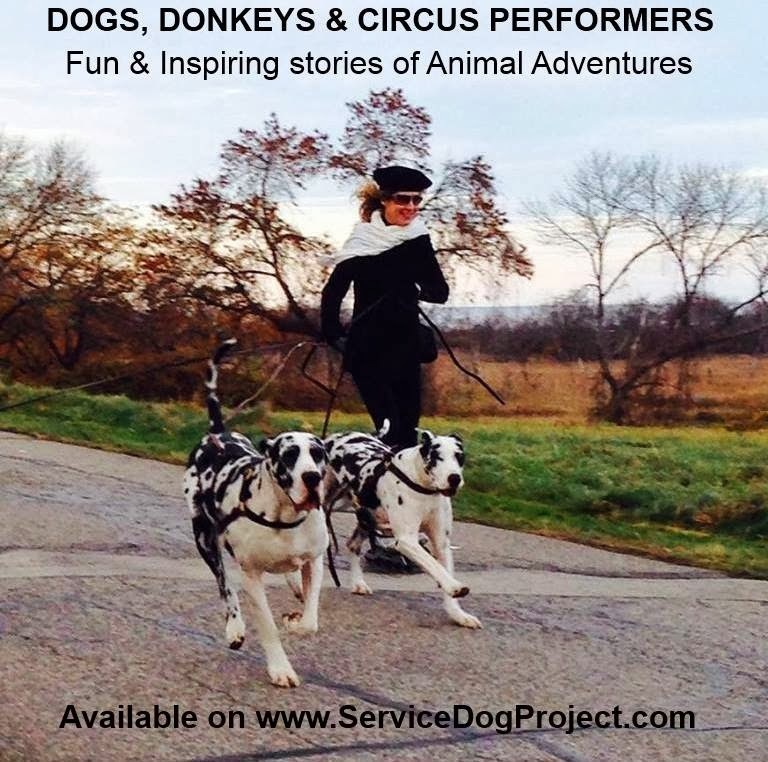 We at Service Dog Project- get requests almost daily about students needing community service hours. There is an entire generation of teens who “speak computer” very well. Many of the same teens need “community service” hours to graduate and or apply to colleges. With the help of their leaders, Teams of teens.. Scouts, Church groups, National Honor Society could provide that service. By having these computer savvy teens set up a computer in a nursing home- senior residence or senior hangout- many more people could enjoy the non commercial world of the explore cameras. At SDP we have 6 cameras on various areas of the farm which broadcast live whatever happens-mostly our 31 puppies either sleeping, eating , or playing..and sometimes our volunteers training, drinking coffee, cleaning up , or napping.. It is live. If the person writes a thank you to SDP for the teen’s service in setting up the live stream, we will read the letters “live” at our 5pm mail call and send the teens involved a certificate for 2 hours of community service. We have viewers who comment from every state plus many countries worldwide. There are very few chances to watch anything without commercials. This is one of them. going with the flow-- i have put a white board up for notices... and we must have that camera on puppies as best we can..... i wonder....... tht camera does have sound if i turn it on...will that be live too??... and maybe roll that camera and let puppies loose for mail call...??? so now the daily vomit report.... tumbler.. yestrday was the vomiter-- and was moved to the nouse-- and seems fine now...her last action was after supper last night grace reported a small glob... howerve- during the night spinner has been tossing 3 or 4 times. lesson of the day..... big lesson... learned the hard way with $1000 worth of stitches on an ear----when i returned one pup to the flat field with he 2 siblings- it was one of my worst mistakes... poor dog thought i was after her too, when i was just trying to break it up... finally she collapsed and i was able to get between her and the other 2 and back them off. she was bleeding ===big time... i can not remember who... but it was a pup about 90 pound size.... and the ear did heal-- but she had to be retired from service work-- the other 2 went on fine.. no problems. it was my mistake clearly. Brief description of stay. Include places visited, people encountered, new sights and sounds. Mention any challenges. Gronk did really well! He was good walking around the neighborhood. He went to my office, Whole Foods, CVS, the bank, the T-station, and a café. In new situations he tends to walk a little fast be and be out just a bit ahead and needs more corrections. Once he feels more confident, he is right by your side. He listens well and seems confident. He is not afraid of stairs but still needs practice taking them more slowly and in control. He does better going down than going up. He has a nice, tight down stay. Very food motivated. Interested in but respectful of the house cat. Good recall, even away from distractions. Gets a little nervous in a crowd (Davis Square, crowded café) and need to work on body positioning in a crowd. I had a hard time getting him to keep tight positioning in a crowd. Definitely a great pup who has all the basics down and just needs miles. Took down into T station to observe and listen to the trains coming through. Got shaky and nervous when he heard the trains but I was able to calm him down and he acclimated. Had some trouble with positioning his body in a busy café when standing and waiting for my order. Didn’t hold steady, swung his rear out. I HOPE WHEN THESE POLITITIANS START THROWING OUT IMAGRANTS THEY REALIZE THEY ARE THREATENING MY SOURCE OF CHINESE FOOD... THERE ALWAYS SEEM TO BE NEW FACES THERE- WITH A WORKING VOCABULARY OF "#2 WITH WINGS?" THE CREW FROM GE CAME YESTERDAY AND PUT UP THE 600' FENCE AROUND THE SWAMPY MUD HOLE IN "A" FIELD--- THIS WILL GIVE US A PRETTY GOOD RACE TRACK IF WE CAN JUST GET THEM GOING AROUND-- WHICH THEY SOMETIMES DO NORMALLY-- THE MUCK IS JUST TOO DEEP- AND I WORRY ABOUT A YOUNG DOG GETTING IN AND STUCK... BUT THEY CAN'T NOW... HOPEFULLY. I AM NOT TOO SURE WHICH PICTURE GOT ON THE 60 PIECE KIDS PUZZLE... I MEANT TO CHECK... ALSO LAST I KNEW THE WEB WAS NOT WORKING RIGHT....... JANINE?????? THIS IS HARDLY EARTH SHATTERING NEWS.... BUT... GOLDIE IS AT IT AGAIN.. ....I HAVE 1 ROOM AND A BATH.WITH AN ALLEY BETWEEN FOR A WASHER AND DRYER. AND ALL MY "STUFF" IS SUPPOSED TO BE IN THERE... I OWN 6 SHIRTS -THERE WERE SHEETS IN THE DRYER- SO I REMOVED THEM.. NOW THE DRYER IS EMPTY.. THE WASHER IS EMPTY- THE LAUNDRY BASKET HAS - AMONG OTHER THINGS ONE "T" SHIRT YET TO BE WASHED.....I HAVE ON ONE "T" SHIRT..MY DRAWER FOR "T" SHIRTS IS EMPTY.-- THERE IS NO PILE OF CLEAN CLOTHES ANYWHERE- --IF MY ALGEBRA IS CORRECT THAT'S 4 THAT GOLDIE TOOK. ...LAST TIME THIS HAPPENED, I THINK THE CAUSE WAS BECAUSE I WAS USING THE WHITE TRASH BAGS TO TRANSPORT THE CLEAN LAUNDRY FROM DRYER TO BED ( ABOUT 8 FEET) AND I ASSUME SOMEONE(OR GOLDIE) SAW THE TRASH BAG AND THREW IT ALL OUT.. I THINK SANTA IS COMING FOR THE FIRST SUNDAY OF DECEMBER--- HE IS A TERRIFFIC SANTA.... HE LOOKS THE PART YEAR ROUND-- HE DIRVES A RED JEEP WITH THE LICENSE "ST.NICK" .... IN DECEMBER HE WEARS THE RED SUIT.- IT IS A GREAT PHOTO OP-- THINKING ALL THESE PUPS... SANTA... AND NEXT YEAR'S CALENDAR??? ?